The last couple of times we were all together, we were discussing the possibilities of a special district in the downtown area of Oakland dedicated to promoting and supporting Black arts, business, and entertainment (“Imagine A Special District In Downtown Oakland Highlighting Black Arts, Business, And Entertainment”, as well as the evolution of the efforts to create such a district (“A Tale Of Two Visions: Oakland’s Downtown Black Business And Arts District”). Where we left off the story, the Oakland Black Arts Movement and Business District (BAMBD) had split into two factions, one under the control of the City of Oakland, and a second one operated by a Black citizens coalition headed by Oakland poet and playwrite Marvin X and Lower Bottom Playaz theater group founding director Ayodele Nzinga, with some assistance in the background by Oakland Post publisher Paul Cobb. Adding to the confusion is that both the city and the Black citizens coalition are using the same name to describe their respective organizations—Black Arts Movement and Business District—and, in addition, the Black citizens coalition BAMBD is now openly feuding with District Three Councilmember Lynette McElhaney, with whom they had originally worked to set up the city-authorized version of BAMBD in the first place. While this seems like one of those difficult Oakland-type knots to undo, actually it’s not, not if one recognizes what two major mistakes were made that led to the current split and impasse in and between the BAMBD(s). Major mistake number one was when Councilmember McElhaney’s Black Culture Keepers Advisory Group voted to changed their recommendation for the name of the downtown Black business and arts district, including “Black Arts Movement” in that recommended name, the Oakland City Council going along with that recommendation when they set up the official name of the city-sponsored district. Major mistake number two was when the Marvin X/Nzinga/Cobb group adopted the name of the now officially-created City of Oakland entity—the Black Arts Movement and Business District—for their own organization, taking actions, publishing a newsletter, and negotiating with various developer interests in that name. As for the first major mistake, let’s not get it twisted. Honoring and acknowledging the history and impact of the original 1960’s-1970’s Black Arts Movement ought to be an important part of the city’s newly-formed Black business and arts district, and any newly-formed organization using the Black Arts Movement name has every right to be included as part of that district. However, honor and inclusion, as opposed to incorporation into the name of the district, are two entirely different things. Let’s state the obvious. Including the Black Arts Movement name in the name of the district itself gives the impression that the City of Oakland believes that the Black Arts Movement was the most important—even the exclusive—arts component of the long history of African-descendant people in Oakland. This automatically leaves out in the cold all those African-American and African and African-Diasporan artists in Oakland who were not a part of the Black Arts Movement or do not agree with that movement’s goals and ideology. 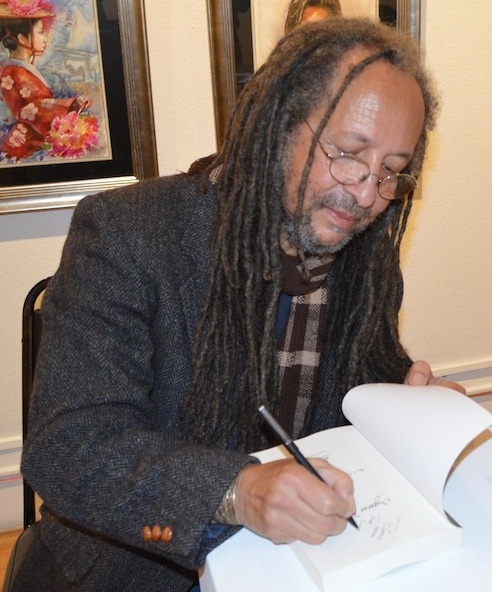 The use of the name “Black Arts Movement”—which describes a specific organization and historial period as well as ideology instead of something which takes in the great breadth of the entire African, African-American, Afro-Caribbean, Afro-Brazilian, and other Afro-Diasporan accomplishment in the arts in and around Oakland—would, therefore, seem to be directly at odds with the stated purpose of the newly-formed Black business and arts district. That, then, was the first major mistake that led to the current problems in the downtown Black district. The second major mistake, as I said, was the adoption of that official name by the Black citizens coalition led by Marvin X and Ayodele Nzinga and Paul Cobb and moving forward to doing business in that name. Here, some of the resulting problems seem to be both obvious and inevitable. An organization adopts a name in order to develop a distinct brand and identity, so that someone comes across that name, they will immediately associate it with the goals and accomplishments of the group or business to which that name is attached. In that regard, a group adopting a name already set aside by an official city agency for its own use—such as the Marvin X/Nzinga/Cobb group has done—automatically confuses the actions and intentions of the group with the city agency. While the city-sponsored district remains dormant and on the drawing board, the only confusion that occurs is that many people are led to believe that the Black citizens’ BAMBD is actually doing its business on behalf of the official city-sponsored BAMBD. But that confusion would spread back in the other direction once the city-sponsored BAMBD actually began operations, so that the Black citizens’ BAMBD would get the blame for any detrimental actions taken by the official city BAMBD. It would be like a citizens police watchdog group adopting “Oakland Police Department” as its name.Why would any organization want to voluntarily take on that burden of confusion? Worse than that, any good actions taken by the Black citizens’ BAMBD might end up not going to their benefit, but to the benefit of the official city-sponsored BAMBD. One of the most successful activities the Marvin X/Nzinga/Cobb version of the BAMBD—or, at least, the one they appear to take the most pride in—has been negotiating community benefits packages with developers seeking Oakland city permission to build projects in the downtown area. All benefits won by the citizens’ group in those negotiations are accruing in the name of the Black Arts Movement Business District. The Black citizens’ BAMBD appears to believe that once the development projects are approved and built and it comes time to deliver on those benefits, the benefits will go to the Black citizens’ BAMBD. However, there is a great danger that when it is time for those benefits to be given out, they will be given out not to the Black citizens’ BAMBD but to the official city-sponsored BAMBD, since any developer entering such agreements could quite plausibly argue that this was their understanding of the intent of those agreements. Finally, the appropriation of the official name of the city’s Black business and arts district by the Black citizens’ group may be one of the reasons why city actions on setting up the district has stalled for a full year. City officials may be reluctant to move forward with a city function whose activities will be immediately confused with a citizens organization that is openly feuding with the Councilmember who helped create the district in the first place. So can this confusing stalemate between the official city BAMBD and the citizens’ BAMBD be resolved? Yes, actually, and without as much difficulty as one might imagine. Aside from the two BAMBDs figuring out a way to work together—a somewhat unlikely occurrence at this point—the simplest way to resolve the problem is for one of the two entities to change their name. Some might argue that it’s the Black citizens’ BAMBD which should do so, since the city’s official adoption of that name gives it the legal preference. I’d argue otherwise, however. Regardless of who has the legal claim to the BAMBD name, it is the citizens group which has done almost all of the work under that name, defining it by their actions. They, therefore, have established the best and most practical claim to the BAMBD name. 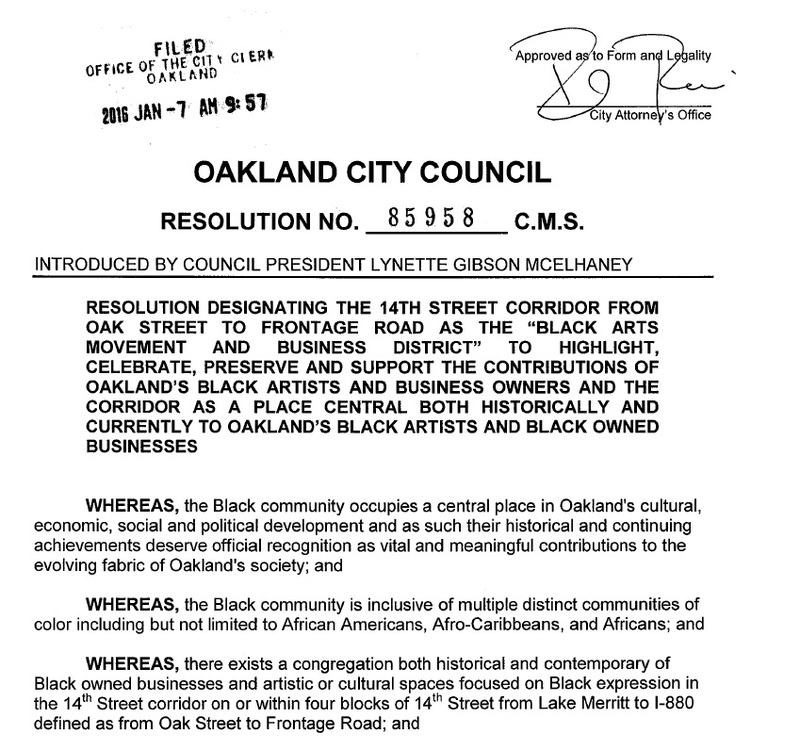 As for the City of Oakland, it has no special attachment to the name Black Arts Movement Business District. The district’s name was changed once already before formal adoption by the Oakland City Council, from the Black Business and Arts District to the current BAMBD, and—since no formal city activities have been undertaken under that name since it’s adoption—the City Council could easily change the district’s name again to something else by a simple amendment to the original Council resolution setting up the district. It’s time to break the impasse and move this important project forward.